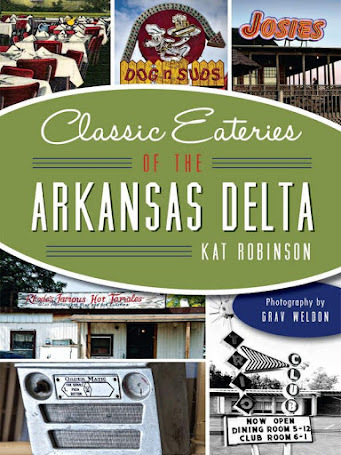 Arkadelphia is light on non-chain restaurants. Since the closing of Bowen's a few years ago, families have been left with few options for good eats. That's part of the reason I'm glad Hamburger Barn has survived. 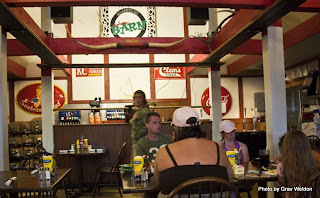 The old country-style steak-and-chicken place on state Hwy. 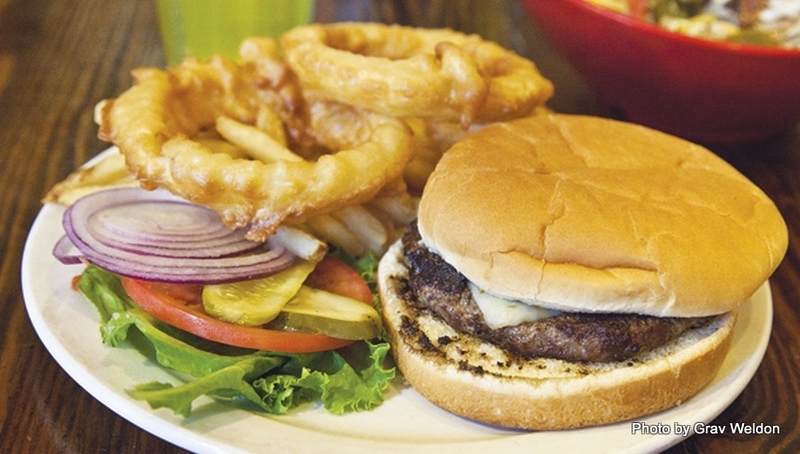 51 a few blocks from Interstate 30 is still turning out great food for a variety of appetites. 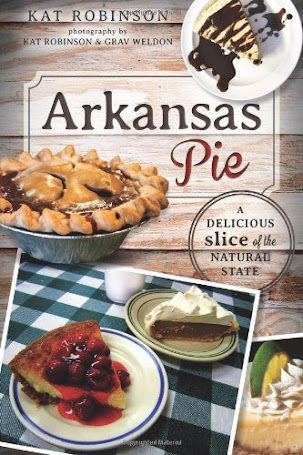 Of course, it didn't originate in Arkadelphia. It started out years ago in Sherwood, before the whole operation picked up and moved to Clark County. 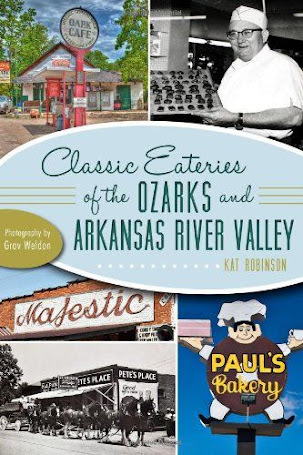 Today it sits along a road that's also home to one of the few remaining Tico Tacos in Arkansas and an outlet for in-state chain Andy's. What do I like about it? A lot of things. 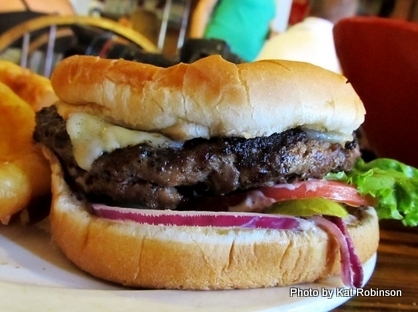 The burgers, for sure -- though there are some who will argue about it with me. You can say what you want about your opinions, but my opinion is certainly in favor of a flame-grilled, hand patted burger patty. That's right. 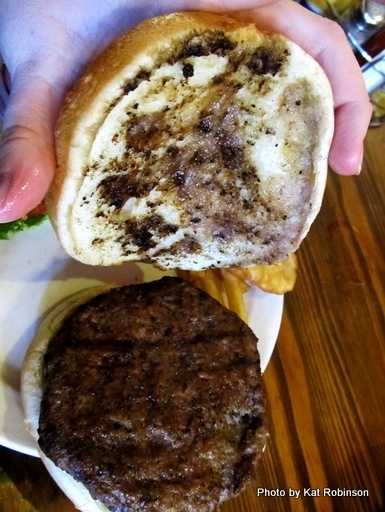 I have experienced the delicious goodness of the restaurant’s signature charbroiled burger. We’re not talking about cooked on a grill in a kitchen. We’re talking cooked over the coals wonderful. To demonstrate, look at this photo. 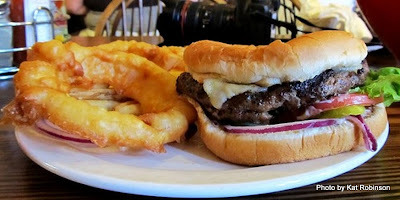 That’s char from the burger coming off on that bun. That’s good stuff, Maynard. You should dig this sort of thing. That’s a Bubba Burger, by the way. $6.79 for this great half pound burger cooked to order and served up with French fries or onion rings, either or both. Comes with choice of cheese; I went for Pepper Jack instead of American or Swiss. Asked for and got it medium rare. It was very juicy and almost sinful. Tasted like it came from someone’s backyard. Yeah, buddy. Better yet, since I got the half and half side I got to experience the dang good onion rings, beer battered and tender and some of the best I have had in Arkansas. 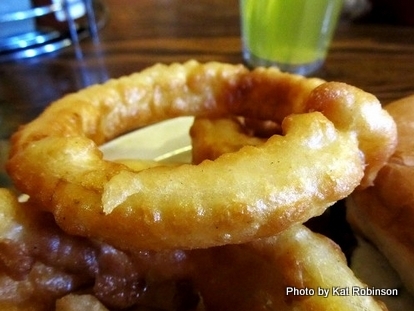 The fries were decent, but the onion rings were just downright lovely. There are other burger options. Grav likes the Bacon Chipotle Burger ($7.49), which is the same as the Bubba Burger with the addition of bacon, sweet chipotle-flavored BBQ sauce and hot pepper jack cheese. This burger is beefy. 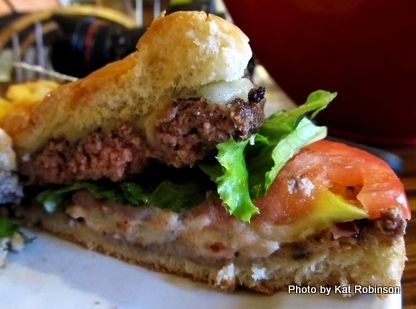 The big fat slices of fresh ripe tomatoes takes the juicy scale of the burger up a notch. 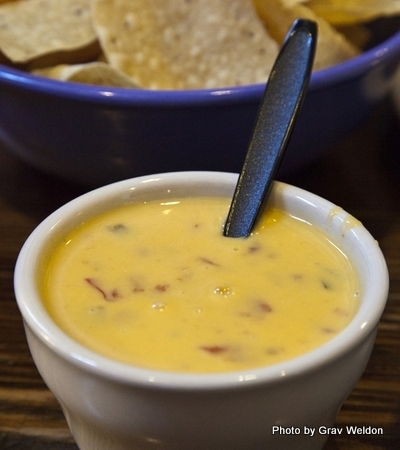 Hamburger Barn also serves up cheese dip, which is why I’m talking about them today. 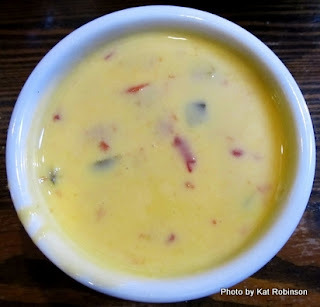 They do cheese dip the way most people do cheese dip at home — Velveeta, Rotel and whatever else they decide goes in it. Perfect example of the recipe. The salsa is extra good, the way Arkansas salsa used to be before Pace started advertising that non-chunky salsa "came from New York City" — a fine cumin-heavy puree of tomatoes with onions. My suggestion is to forgo the chips that come with it and go for French fries. Oh golly yes. Of course, there are other great things to go along with the burger and cheese dip. There's the Macho Nachos ($7.29). The massive bias-edged elliptical bowl hold a hearty amount of the ingredients: cheese dip right on top of thin tortilla chips, chili with beans, lettuce and tomato, salsa and sour cream. The bowl is more than a meal's worth; you might want to share it with others if you get it. Grav likes the fried calamari ($5.99), which is served up with a very sweet tomato marinara. I also like the chicken enchiladas ($8.99), which came with salsa and chips, a dollop of guacamole, another of sour cream and a scattering of pico de gallo on top of shredded lettuce. 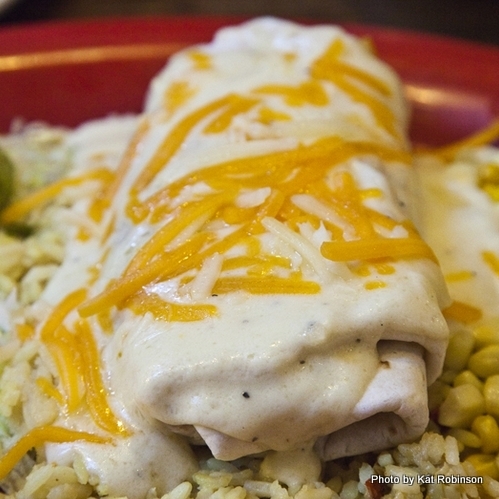 The enchiladas surprised me, since I we received looked like a large burrito, covered with a sour cream sauce and cheese on a bed of yellow rice. The shredded chicken and that traditional red enchilada sauce are on the inside. And do get the corn on the side... it comes in a variety of colors and has just been roasted enough to take off the raw edge, sliced hot off the cob. 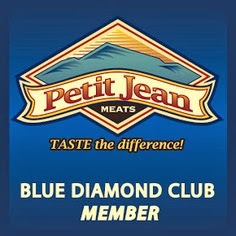 It’s worth it, especially if you’re heading down I-30 and want to put some meat on your bones. It’s on Highway 51 (second exit heading south, turn left at the end of the ramp) and it’s open every day for lunch and dinner (except no dinner on Sunday). 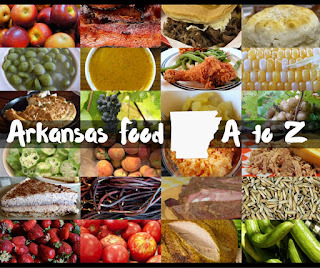 (870) 246-5556 or check out the restaurant’s Facebook page.